This stunning example of American muscle will destroy many famous supercars. The fifth generation Chevy Camaro introduced two high-performance models that slotted above the standard V8 SS. 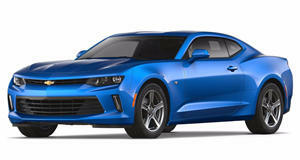 The most powerful was the 580-horsepower supercharged ZL1, but the most expensive model was the track-focused Z/28 model. The Z/28 was only built for two years in 2014 and 2015, and the price when new was a staggering $75,000. Sure the Z/28 was a special car, but it might not have been worth its hefty price tag. That is why these cars were selling at a huge discount shortly after hitting the used market. Now, the Camaro Z/28 has become very affordable. We found a red 2014 model for just $49,995 at Naples Auto Collection in Fort Meyers, Florida. And don't think it's cheap because of high miles: this car has only 336 miles on the odometer. That makes it practically a new car priced $25,000 less than MSRP. This is a whole lot of car for the money. The Camaro Z/28 didn't have as much power as the ZL1, but it did have the larger, 7.0-liter engine. The LS7 V8 was also used in the C6 Corvette Z06, and produced 505 hp and 481 lb-ft of torque in the Z/28. 505 hp is nothing to scoff at, but the Z/28 really made its name through impressive handling. Thanks to extremely wide and grippy tires, the Z/28 Camaro was the best handling Camaro of the time and was still competitive even when Ford released the Shelby GT350R a few years later. The Camaro Z/28 does 0-60 mph in 4.4 seconds and completes the quarter-mile in 12.7 seconds, which is pretty impressive. However, its track times are what really makes the Z/28 stand out. On the Nurburgring, the car managed to set a lap time of 7:37.47. That makes it faster around the Ring than cars like the 997 Porsche 911 Turbo, Lexus LFA, Lamborghini Gallardo Superleggera and Ferrari F430 Scuderia. The Z/28 has Pirelli P Zero Trofeo Rs which are basically street-legal race tires that stick to the pavement and do not work in the rain. These tires weren't just sticky on the Z/28, they were also the widest front tires on any road car. The Camaro Z/28 had P305/30R19 tires on all four wheels. It was also fitted with cross-drilled carbon-ceramic brakes with six-piston front and four-piston rear calipers which could stop the car from 70 mphin just 155 feet. Adding all of these features with GM's magnetic ride control resulted in a car that was nearly impossible to keep up with on the track, especially at that price. So why didn't the Z/28 sell well? Part of the reason why the car is so cheap now is that the dealerships had trouble selling them when they were new. Perhaps this is because the Z/28 was far from the most livable Camaro. GM did everything possibly to make the car light weight. The Camaro was pretty heavy to begin with, so getting the weight down was no easy task. Camaro chief engineer Al Oppenheiser told Car and Driver that it “took out everything that didn’t make it go faster or wasn’t required by law.” This means the car didn't come with air conditioning as standard, and only had one speaker which was required by law to sound the seatbelt chime. Floor mats were also not included and buyers didn't get the tire inflation kit unless the car was purchased in Rhode Island or New Hampshire where it is required. The Camaro Z/28 may not have been popular when new, but is now an amazing value machine on the used market.